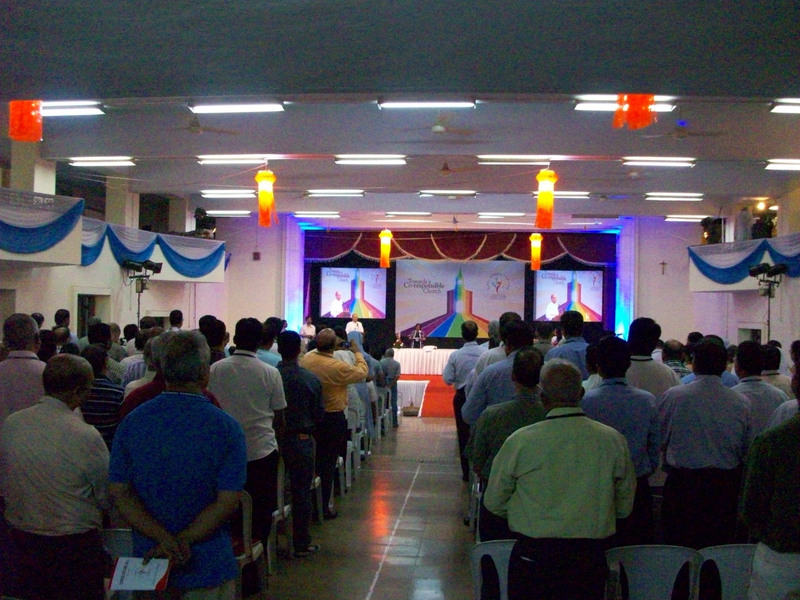 From 12 – 14 November, 2012 the Archdiocese of Bombay had the Consultation at St Pius X College, which came as the culmination of a 10 month preparation beginning from January 15, 2012 thanks to the Working Committee headed by Rev. Fr. Gilbert De Lima, Coordinator of the Consultation. The last time an assembly of this kind was convoked in 2006, which was the Mid-Term Synod Assembly (MTSA) which was held in order to examine the progress made in the implementation of the recommendations of the Archdiocesan Synod of 2001. The opening Eucharist was presided by Bishop Bosco Penha. Bishop Agnelo Gracias solemnized the Eucharist on the second day. Besides Cardinal Oswald Gracias, and the aforementioned Bishops, also participating were Bp Percival Fernandes, representatives of the Archdiocesan Curia, both Administrative and Judicial representatives of the Archidiocesan Consultative Bodies, Committees and Commissions, parish priests, elected assistant parish priests, Provincials, Superiors General and lay representatives from the various deaneries. There were nearly 400 persons participating. Our provincial, Sr Ancy John fsp was invited to participate in the Archdiocesan Consultation, in capacity of being Provincial. Sr Matilda D’Souza also attended as representative of the CRI (Mumbai). Sr Joeyanna was already part of the organizing committee since April, as she was requested by the Consultation Working Committee to collate the responses online from all the parishes during the two phases, when discussions were had regarding various aspects, like faith, family, youth, governance, environment, education, SCCs, CCOs, marginalized, gender sensitivity, medical care and media networking in relation to the diocese. At the Consultation from 12 – 14 November, Sr Ancy was also invited to be one of the nine Chairpersons. Her topic was Gender Sensitivity, which she handled very effectively on 13 November, the second day of the consultation. From 9 a.m. of 12 November to 7 p.m. of 14 November, the time was tracked and meticulously planned by the Working Committee of the Consultation. There were 9 sessions in order to discuss the topics already mentioned above. After the session was introduced by the Chairperson, 40 groups of about 8 – 10 participants each discussed the questions given for about half an hour. Their answers through the respective secretaries were collated by 8 collators, and read at the assembly. This was followed by the plenary assembly on the particular topic which was finally concluded by the Chairperson. There was no time wasted, and even when the assembly had to wait for reasons of collation of data and secretarial work after the group discussions, the masters /mistresses of ceremony kept the participants occupied. It was obvious that those involved, Fr Gilbert DeLima, the Coordinator and the Working Committee of 13 members, Mr. Melwyn Sequeira and the OLCM team of volunteers(guided by Fr. Aniceto Pereira) had worked round the clock to accomplish this mammoth task and not left any stone unturned in order that the participants be comfortable and that the consultation run smoothly. On the third day, the two final plenaries were held and through all these the Final Document was being prepared. The participants seemed adept with signs of the times and were eager to have their points included. Meanwhile the draft working committee too put in a lot of hard work to incorporate the grievances and suggestions of the participants which obviously reflected the groups or parishes they were representing, besides being their personal views. The Consultation concluded with a solemn Eucharist which was liturgically very beautifully planned, presided by Cardinal Oswald Gracias. Let us hope that an implementation committee is formed in order that all the hopes and joys of the Archdiocese be made a reality.